I love Neil Gaiman’s stories. In fact, I am crazy about his work. I have been waiting since December for the release of this novel. And when I finally got it, I devoured in a few hours. Here’s what I felt about the book. Norse Mythology, is firstly an anthology of some of the well-known stories of the Norse Gods like Odin, Thor and Loki. My exposure to Norse Mythology was so far only restricted to what Marvel decided to show me. I knew of the mighty Thor in the skin of Chris Hemsworth and the handsome and sly Loki through Tom Hiddleston. This book is a journey of these characters – their origin, their adventures, their plays and finally, their end. The last chapter, Ragnarok, was truly exciting and filled with adrenaline rushes. It got me excited for Thor -Ragnarok. 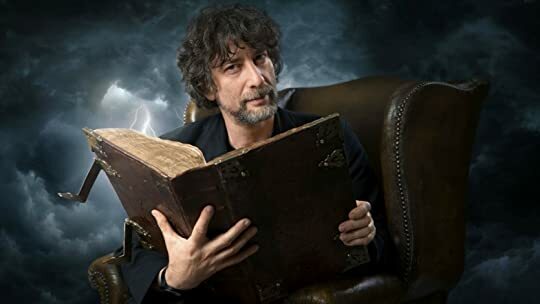 Listening to Neil Gaiman’s narrations was a joy, as usual. He was brilliant as ever. Loki, the ever mischievous and sly fox among the Gods played the role of ‘Narada Muni‘. Loki meddles in the business of the Gods and creates troubles for them. But, at the end of the day, it is Loki who saves them. I laughed out at his antics and his bashful-but-not-bashful smile. It seemed like Loki was the life and laughter of the otherwise grim Gods of the Norsemen. Loki is an interesting character. I believe Marvel did perfect justice by choosing Tom Hiddleston to play the role of the God. You resented him even when you were at your most grateful, and you were grateful to him even when you hated him the most. Brutality is in the nature of the brave Vikings. When I think of Vikings, I think of the beefy men in their horned iron helmets and braided red beards; I think of pillaging, pub fights and raucous merriment. Norse Gods stay true to this description. Only a handful of them seem to possess brains in addition to brawns and even fewer of them seem to want knowledge. [Odin has to sacrifice an eye to drink from the Well of Wisdom and later, his life to understand Runes]. The Vikings valued bravery and brute strength, as displayed by Thor. This rowdy nature of the Gods endeared them to me. The something missing is something that I can’t put my finger on. Maybe I’m refusing to put my finger on it because I love Neil Gaiman. Norse Mythology felt like a book that anybody could have written with research. I was reminded that it was Neil Gaiman’s writing in very few instances of the book. A difference only an ardent NG fan will be able to discern, I’m sure. To the rest of the world, this is a collection of wonderful stories. Never mind, I can assuage my gripes about the writing by listening to the audiobook. Neil Gaiman’s narration stands tall and unparalleled. Sudha Murthy’s writing style is familiar to me. She has been writing stories for many years and her simple, effective words can affect the deepest parts of me. Simple but powerful. I’ve come to expect that of Sudha Murthy ji. I wonder if Gaiman’s target was similar. Did he want to simplify and tell the stories without touching them with his trademark literary Midas touch? To be honest, some stories were just plain boring. My least favorite one is the one that doesn’t have Loki in it – The Mead of Poetry. Odin was terribly dull in that one. Maybe, one long story would have done in the place of 15? I don’t know. I guess I wasn’t setting my expectations right. The best way to go about reading Norse Mythology is to plunge into this book without expectations. Then your appetite for Norse Mythology will be whetted; But whether or not your Neil Gaiman starvation will get satiated is left to the individual. Personally, it wasn’t. When I finished the book, it felt like this wasn’t enough. I needed more. I’d definitely add this to my library, but I’ll be reading this less as a bedtime story and more as a “wikipedia page” for reference.